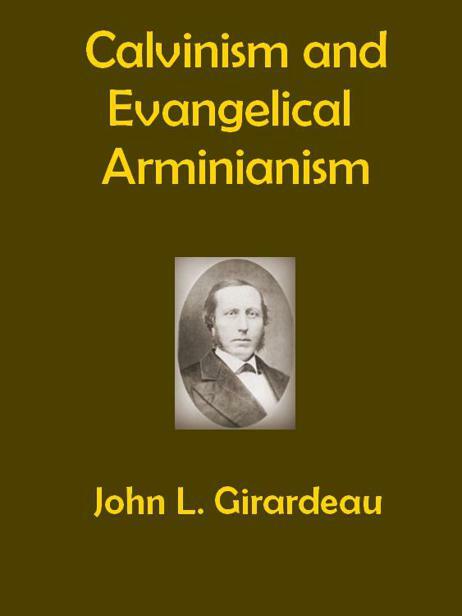 CALVINISM AND EVANGELICAL ARMINIANISM: COMPARED AS TO ELECTION, REPROBATION, JUSTIFICATION, AND RELATED DOCTRINES. BY JOHN L. GIRARDEAU, PROFESSOR OF SYSTEMATIC THEOLOGY IN COLUMBIA THEOLOGICAL SEMINARY, SOUTH CAROLINA. DURING the temporary occupation of the pulpit of the First Presbyterian Church in this city, a few years ago, some of the young members of that church requested me to instruct a Bible-class, on Sabbath nights, in the distinctive doctrines of the Calvinistic faith. A large number were enrolled, and the understanding was that the members of the class would be entitled to a free interrogation of the instructor. Unexpectedly, from the very first, a large promiscuous congregation attended, and the liberty to ask questions was used by outsiders, the design appearing to be to start difficulties rather than to seek light, and to convert the exercise into a debate. To avoid this result, and to treat objections in a more logical and orderly manner than was possible in extemporized replies to the scattering fire of miscellaneous inquiries, resort ere-long was had to written lectures. Notwithstanding this change, the attendance and the interest suffered no abatement, but rather increased - a fact which seemed to militate against the common opinion that doctrinal discussions would prove dry and unacceptable to a popular audience. The lectures, which were prepared not without painstaking labor, suggested the production of a formal treatise on the subjects which had occupied all the available time-namely, Election and Reprobation, with special reference to the Evangelical Arminian theology. This was done, and a discussion of the doctrine of justification, in relation to that theology, was added. Another reason which conduced to the preparation of this work was the conviction that there is room for it. A distinguished writer has remarked, that one who solicits the attention of the public by publishing a book should have something to say which had not been said before. This opinion, no doubt, needs qualification; but it applies, to some extent, in the present instance. The ground covered by the controversy between Calvinists and Evangelical Arminians has not been completely occupied. John Owen's "Display of Arminianism," and similar works of the Puritan period, antedated the rise of Evangelical Arminianism. Jonathan Edwards was a contemporary of John Wesley. Principal Hill's comparison of Calvinism and Arminianism had reference mainly to the Remonstrant system, as developed by Episcopius and Curcellaeus, Grotius and Limborch. The same is, in a measure, true of Principal Cunningham's comparative estimate of Calvinism and Arminianism in his Historical Theology. The comparative treatment of Calvinism 'and modern, Evangelical Arminianism, contained in works on Systematic Theology composed in recent times, are, however able, necessarily brief and somewhat meagre. Such works as those of Green, Annan and Fairchild hardly profess to be severely analytical or exhaustive of any one topic. Dr. N. T. Rice's "God Sovereign and Man Free," although a valuable discussion, is brief, and leaves much to be said even in regard to the question it handles. There seemed, therefore, to be room for further discussion concerning the relative merits of Calvinism and Evangelical Arminianism, and it is hoped that the present attempt will not be considered arrogant on the ground of being superfluous. Still another incentive leading to the production of this volume has been furnished by the taunt ever and anon issuing from Arminian sources that "Calvinism is dying," and the sneering intimation of recent works-Dr. Miner Raymond's "Systematic Theology," for example-that but few people of sense now pretend to hold some of its peculiar and monstrous tenets. An honest indignation justifies the disproof of such contemptuous allegations; and, however inadequate may be the present defence of the venerable theology thus belittled, it is prompted by the profound conviction that the system known as Calvinism expresses the faith of martyrs, confessors and reformers, the faith in which the majority of Christ's true people have lived and died; that it is the truth of God ; and that, instead of dying, it is as immortal as that Inspired Word which liveth and abideth forever. If opponents deem it to be dying, and imagine that they can hasten its coveted dissolution, they will find its supposed dying-chamber an arena of vigorous contest, and its fancied death-bed a redoubt that neither they nor the powers of hell can carry by storm. The work does not assume to cover the whole field of the controversy of which it treats, to discuss articulately all the distinctive views of the systems compared. It is its purpose to bring out their radical and controlling principles, in themselves and in their necessary connections, to confront them with each other, and to subject them to a searching examination. I have endeavored to write in a calm and dispassionate temper, consistent with sincere, brotherly love to those of God's people from whose views I differ; and, in submitting the results of long reflection, embodied in this volume, to the judgment of candid readers, I invoke for them a like calm and dispassionate consideration. The work is humbly committed to Him whose truth it professes to vindicate, with the prayer that He will deign to employ it for His glory and the good of His Church. Especially would I be grateful, if He would be pleased to use it for arresting, at least in some degree, the tendency now manifested on the part of some professed Calvinists seriously to modify the doctrines of the Calvinistic Symbols. COLUMBIA, S. C., Jan. 18, 189o. 1. Objection from Divine Justice. 2. Objection from Divine Goodness. 3. Objection from Divine Wisdom. 4. Objection from Divine Veracity.